These events will bring together composters to network, share best practices, and build support for community scale composting systems and enterprises. The Cultivating Community Composting Forum 2016 is the third national forum sponsored by the Institute for Local Self-Reliance and BioCycle. Scholarships are available to community composters! In this half-day workshop for community composters, we will walk through practices that work. Topics include: creative financing, operator training, engaging community and recruiting participants, food scrap collection, equipment and small-scale systems, site planning, complying with regulations, outreach and communications, cooperative structures, technology platforms, marketing compost, measuring impact, managing the compost process, and overcoming roadblocks. We will address how to take your community-scale composting to the next level. Walk away knowing how to adapt the efforts and achievements of other programs for your community. Open to community-scale composters who are composting on-site at schools, community gardens and farms or otherwise keeping the process as local and small-scale as possible while engaging the community through participation and education. Pedal-powered collectors welcome. 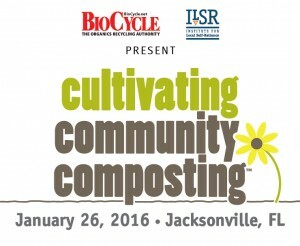 Practitioners: A diverse team of community composters will lead this workshop. If you’re interested in participating, please email Joshua Etim at info@ilsr.org. Register on the USCC web site, here. Scholarships available to community composters! Apply here by November 13th. After that, email Joshua Etim at info@ilsr.org. This Forum will take place as a track on the first day of the US Composting Council’s International Conference and Trade Show (January 25th-28th). The first panel will feature innovative strategies to grow community composting: technology platforms, cooperative structures, best management practices, and more. The second panel will focus on why equipment manufacturers, commercial composters, and local and state government should care about community composting. It will feature lightening presentations from community composters on three core topics: equipment needs, collaboration with commercial sites, and city-supported programs. Panels of experts will respond to the lightening talks and spark dialogue. Show how community-scale composting fits in and complements the larger composting industry, both collection and processing, and both for individuals and organizations. Showcase the variety of models and innovative ideas that are growing from the ground up. Spur a community-based composter network that will stay connected following the conference. Scholarships available to community composters! Apply here by November 13th. Community composting programs keep the feedstocks, process and product as local as possible while engaging the community through participation and education. Projects range from urban to rural and include small enterprises, demonstration/training sites, schools, universities, pedal-powered collection systems, worker-owned cooperatives, community gardens and farms.